Web browser developer Brave Software has a new weapon in its arsenal against third-party advertisements. While the Brave browser has been automatically blocking ads that target users based on their browsing habits since earlier this year, the beta version of Brave Payments, launched today, is the latest move to advance a disruptive business model designed to give users control over their web experience – and the data it creates. Brave founder and CEO Brendan Eich told CoinDesk how the startup’s technology can be used to give users the power to reward websites with content they enjoy and practices they agree with. To get started, users can either top-up their existing bitcoin wallet, or create one using an integration with Coinbase. Users then set a monthly amount they want to spend, and the browser automatically calculates how to disperse the money to the selected websites based on page impressions. Using a toggle feature familiar to Apple owners, the interface then lets users select if they don’t want to pay some of their most-visited sites. For example, Eich says he’s turned off micropayments to subscription sites he already pays for. Some sites also have been automatically disabled, so users cannot pay them even if they want. Sites that rely on user-generated content such as YouTube and Twitter, for example, cannot currently receive bitcoin. In the future, however, Eich said he would like to enable micropayments at those sites, giving users the power to pay the content creator instead of the host. In other words, if a Brave user in the future is a fan of a particular YouTube channel, he or she might eventually be able to pay that particular user directly. “We’re not going to let our users pay [those sites] because we want to support user-generated content. But we’d like to be able to let users pay the tenant, not the landlord in the future,” Eich said. When Brave first launched earlier this year, its ad-blocking service received widespread criticism from the publishing industry for what a trade group called “blatantly illegal” technology it said would stunt its members’ ability to generate revenue on their content. But at the time, only part of Brave’s functionality had been enabled, and it remains unclear whether the publishing industry will continue this course of action against the startup. 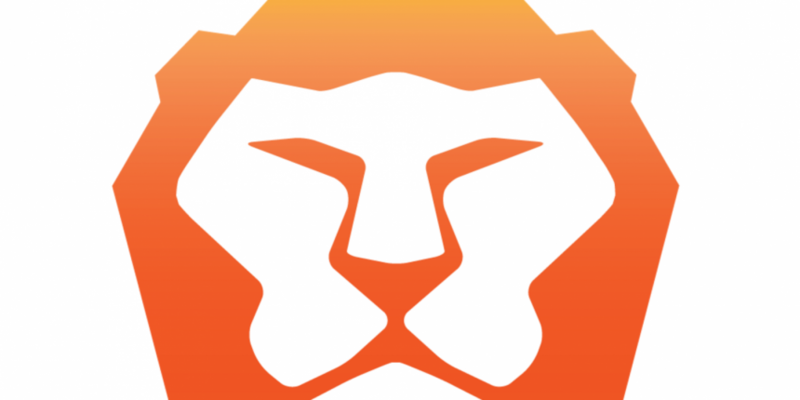 Now that the feature is live, Brave is continuing to position the browser as a tool to help news sites and other content creators recoup revenue currently being lost by those already using ad-blocking technology. In an August interview with CoinDesk about Brave’s $4.5m investment, Eich said that since the initial push-back from publishers he’s engaged with many of them who have begun to view the technology in less aggressive terms. Eich estimates that someone using that tech could offset those losses by topping-up with $5 worth of bitcoin every month. Until then, Brave plans to continue its work not only contributing to that lost revenue, but giving users an option to pay. In May of this year, Juniper Research forecast that ad-blocking technology would result $27bn in lost revenue by 2020. Ad-blocking technology has gathered increasing support by courts around the world, and appears unlikely to be shut down anytime soon. Instead of letting that revenue slowly trickle away, Eich said Brave is only at the beginning of creating new ways to offset losses. Currently, a user’s most popular websites are determined by page view, but Eich and his team are exploring new ways to generate that metric. One option is to measure time spent on each site, though more study is required to help ensure that a webpage that is displayed is actually being viewed. He tells CoinDesk Brave will never use eye-tracking technology. 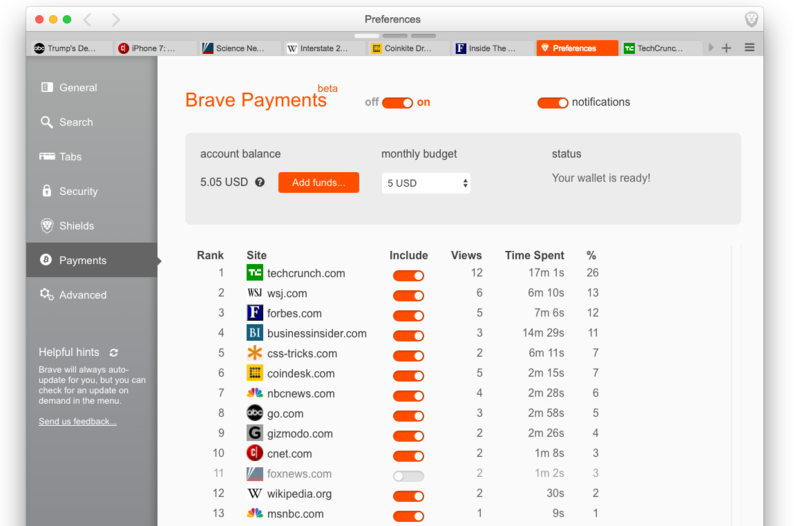 At launch, Brave plans to hold the monthly payments in escrow and send them in bulk to avoid bogging down the bitcoin network, which can only process about seven transactions per second. But in the future, he said improvements to the bitcoin infrastructure such as the Lightning Network and Segregated Witness could enable micropayments in real-time. Other changes that could appear in future releases might be additional currencies. In particular, Eich said he’s watching the development of Zcash, a soon-to-be launched cryptocurrency that masks both the counterparty identities and the amount being transacted. The launch of this beta version of the product is intended to help Brave sort through some of the above unknowns as part of the lead-up to the 1.0 version later this year.